I was blessed to be part of a calling to "go" to Reynosa, Mexico in late January/early February of this year. I've been allowed to go now for a few years and each time, I return with better understanding and compassion for the impoverished there and around the world. Because of other brothers and sisters in Christ, I am involved with Haiti and Uganda as well, though I have not traveled there. But in presentations from others, one with the heart for the poor feels transported there, and shares with the highs and the tears of despair that is a daily part of life in these regions and so many others. On this mission trip, a group of about twenty of us, were so blessed to be able to build a home for a family of six. The father's name is Johnny. The cool part is Johnny can speak fairly good English, so conversing with him was easier and speaking to his wife and children could be translated. Johnny will soon be a minister, as he has been studying for quite some time. The financial expense for this has surely burdened their household there. I found while there that unemployment is over 50% and minimum wage 75 pesos ($3.50) a day, so life is burdensome there. 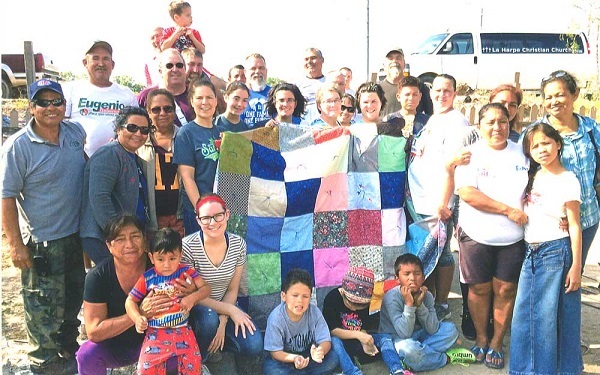 The ladies from our church (Bethel Lutheran) had hand sewn several quilts that we brought along, as well as one from another church. In the photo, is one of these beautiful quilts sewn with love and much laughter. I had in mind to get a photo with everyone we came down with, and as we began to set up, we knew that we needed to include all that were present. There are twenty of us, members of the family we built a house for, a few workers we had hired to help, and ladies from a sewing circle began there on the "canal" as a job-skills training that helps provide money for their families as well. Inviting all into the photo, brought smiles to everyone's faces. We bonded so well with the families and began a lasting friendship there. We were so blessed to stop and visit with Lupita and her family that we built for two years ago, many tears were flowing, it was awesome. There is so much good that has happened with being part of a mission group and being able to see the Lord's hand move in the lives of so many. Our "motto" has become: "It's not about the house, it's about relationships". The home is the tool the Lord uses if we will see it as such. We have and it changes lives. I want to say within this group there are believers from Stronghurst Lutheran Church, Stronghurst Methodist Church, Stronghurst Christian Church, La Harpe Christian Church, and a Christian Church in Texas, not to mention the churches the people we built for attend on the canal. In truth, the "church" of Christ is who is in the photo, which are members of the body, setting all buildings and denominational titles aside and uniting to do what the Lord had commanded, "go", so, we go. What a mighty church it is becoming! So many back home are involved in so many ways, from so many directions and are just as much a part of the body as those in the picture. One cannot fully function without the other. There is a special joy to be a part of all this, a joy that only can bring glory to a Mighty God.